East Midlands Trains (EMT) has said it will appeal against a High Court ruling preventing it blocking industrial action by the RMT union. The company had applied for the injunction after the union urged its members not to do overtime. 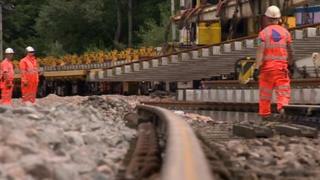 A work to rule began on 20 July, coinciding with major engineering works at Nottingham station. EMT said it was taking the action to protect passengers from what it claimed was unlawful strike action. It urged the RMT to put customers first and have constructive talks to end the dispute. However, the union said the train company should stop wasting money on legal action. EMT is applying to the Court of Appeal following the ruling from the High Court, last week. A spokesman said: "The RMT has deliberately targeted passengers during a £100m major set of improvement works, which has meant disruption to customers' normal journeys. "We have worked with our railway partners and other organisations in the region to put a comprehensive plan of alternative services in place." The company added: "Instead of supporting that work, the union seems intent on making life as difficult as possible for passengers - causing the direct cancellation of services and delays." RMT leader Bob Crow said: "It's a shame that East Midlands Trains have wasted time and money dragging RMT into court under the cloak of the anti-union laws. "They should have been trying to resolve this dispute which is all about treating RMT members on this franchise with dignity and respect." He added: "The industrial relations climate on East Midlands has sunk to a new low with the company attempting to bulldoze through changes off the back of an engineering blockade. "This has been planned over the long term and is now being dressed up as a bogus emergency to try and justify ignoring procedures and ripping up working agreements." Work at Nottingham station is taking place until 25 August.